On Monday I published the final list of Leadership Day 2010 posts. Today I'm going to highlight a few that, for one reason or another, particularly resonated with me. This is by no means a 'best of' list but rather an attempt to capture a few things that struck me as I read through each post. With one exception, the highlights below are in the same order as the list from Monday. Again, a big thank you to everyone who participated this year. Happy reading! Rob Jacobs (@eduinnovation). What Do You Think You "Hired" Your Technology To Do? You want to give your student access to the web to look up information and learn information literacy skills. That seems implicit to you. However, your students want to use the web to share information. You wanted them to consume, they wanted to produce and share. You have "hired" the web to do a different job than the students have "hired" it do. You "hired" Google Docs so students could work in small groups in the classroom on projects. Your students "hired" Google Docs so they could collaborate with people, including content experts and other students, across the globe. You "hired" technology to aide student collaboration is groups of 2-3. The students "hired" technology to aide collaboration in groups of 200-300. . . . Are you ready for that? Can you deal with that? Carolyn Foote (@technolibrary). Stepping out of the bubble. How do we step outside of what we know so we can experience it in a new way? And how can we get new ideas when we are so immersed in day to day management of our own districts? Fred Koch (@fkoch). Leadership Day 2010. I have come to believe that "it" is so big, so complex, so multidimensional that "it" is nearly impossible to define. Basically what I am saying is that "it" simply means different things to different people. There are leaders who truly believe they understand "it." The problem comes when we try to define and articulate "it." Jon Becker (@jonbecker). Who are the thought leaders in educational leadership? If professors of educational leadership truly want to be the thought leaders and to be a part of any sort of school change process, they need to . . . stop publishing their high-quality, thoughtful work in journals that nobody who does the work of school leadership reads. One of Jon's best posts ever. Kristen Swanson (@kristenswanson). Leadership Day 2010. Pam Moran (@pammoran). Staying Relevant as Leader and Learner. I'm convinced that we administrative leaders have an obligation to initiate new learning, become skillful in the use of new tools that accelerate and advance our learning work, and share with others what we are learning. . . . Becoming an educator with the contemporary knowledge and skills to influence and teach others is as essential an expectation of administrative leaders as it is for teachers. Our kids don't wait around on someone to tell them to learn a new technology and neither should we. Queenie Lindsey (@tandemteaching). An Open Letter To Administrators| Leadership Day 2010. A superb Top 10 list of things teachers need from administrators if they are to better incorporate digital technologies into their instruction. Scott McLeod (@mcleod). "No thanks. I choose to do nothing." Can I exercise blogger's privilege and say that I liked my own post (and the discussion that ensued there)? Sheryl Nussbaum-Beach (@snbeach). 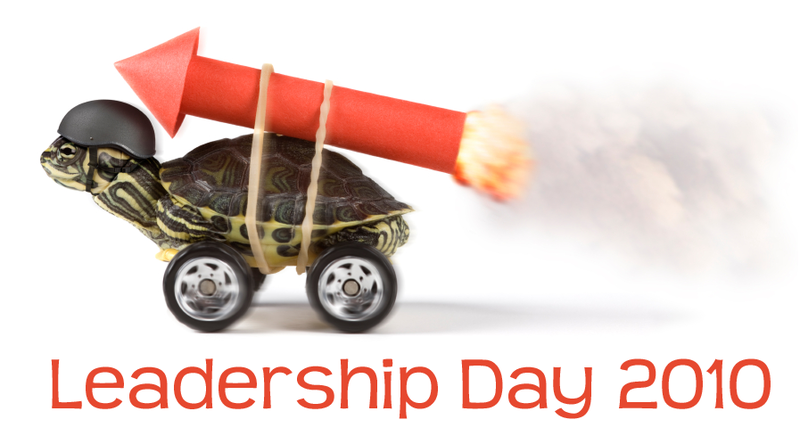 Leadership Day: A Day Late. Riffing off Clay Shirky's new book, Cognitive Surplus, Sheryl asks: What if we, as educational leaders, took the time we all spend watching our favorite shows on TV and used it for design thinking: inspiration, ideation, and implementation? Tim Gwynn (@tgwynn). How About Some Walk To Go With That Talk? Use technology to enhance your life as well as the lives of your teachers, staff, and students. Please keep talking about it, because that dialogue is important. However, show us that you know technology is a crucial part of education. It's time to walk the walk. Let's see action. Tim Stahmer (@timstahmer). What Do You Do All Day? Apple employs many creative and talented people and [Steve Jobs'] primary role is to clear the obstacles, foster collaboration, and allow them to use their talents to the greatest degree possible. I would hope our leaders, both inside and outside of the education structure, would view their role exactly the same way when it comes to improving student learning. Unfortunately, these days things seem to be heading in the opposite direction. To more standardized classrooms, rigid, narrow curriculums, and prescriptive teaching designed to meet the growing demand for more standardized testing. So, I wonder how things might change if Steve Jobs was leading American education. Instead of Bill Gates. Natalie Wojinski (@mswojo). Leadership Day 2010: Dear Administrators. I love it when Natalie says: Please get over your fear of NETWORKING. Justin Bathon (@edjurist). Rubber ... Meet Road: Leadership Day 2010. Justin shares a fantastic reflection on lessons learned (and continuing challenges) for a statewide education innovation initiative. There are lots of good things happening in Kentucky. I'm heading down in early September to check it out (and help out a little). Kevin Hodgson (@dogtrax). Leadership Day 2010: A Webcomic Message. 1. The comic strip format is super fun! 2. Kevin's principal says, "Take chances. I'll be in your corner, don't you worry." We need more principals and superintendents saying this! Doug Johnson (@blueskunkblog). CODE 77Rubrics for Administrators. Undaunted by the enormous challenge, Doug creates his own technology leadership rubrics for administrators. Becky Fisher (@beckyfisher73). Educational Leaders Must Be Self-directed Learners. Here's a worn out school scenario: a student brings a device to school and starts pulling it out during "full frontal teaching" episodes or worksheeting activities. The teacher is disturbed by the fact the student is "not paying attention in class," collects the device and sends the kid to the office. The principal fusses at the kid for "not paying attention in class" and informs the kid that the parent has to come to school to pick the device up. The parent comes in the next day to pick the device up and the principal talks about how important it is for parents to support the school in these discipline matters. Where in this scenario does anyone other than the student think about the quality of the classroom experience the student was opting out of? Where in this scenario does anyone other than the student realize the potential power of this "device?" Brian channels Karl Marx: What the workers can do (their productivity) is limited by the owners' control of the tools. It's one of the many ironies and paradoxes of capitalism  that there are many situations in which relinquishing control would actually yield owners a greater surplus of goods/services, but the last thing owners give up (besides profits) is control. . . . [When it comes to educational technology,] liberate the means of production! Carl Anderson (@anderscj). An Invitation Letter to Parents. Carl proposes that every technology-savvy teacher send a letter home to parents. An awesome idea. Josie Holford (@JosieHolford). More Educator Luddites Please. We need to . . . establish a whole new ethos of luddism in our schools. The educator luddites I have in mind are people who have always understood school to be more than test prep and who see themselves as far more than the agents of a standardized testing industry. I see them leading the way to create inquiry driven schools where students and teachers are not too busy to think. Schools where the technology serves the learning rather than drives the teaching and where the demand for original work is a collaborate effort to solve compelling problems to which no one present knows the answer. In such a school, the curriculum is not driven by the textbook, the flow of information is not unidirectional, learning is networked and students and teachers work together across the boundaries of age and experience as active seekers, users and creators of knowledge. In this rosy picture, individual schools form a kind of globally aware and networked cottage industry of creative learning. Paul Bogush (@paulbogush). Acoustic Teaching. Before you decide to push technology into the curriculum, I would just ask that you pause and find out if you will be amplifying mistakes? or allowing some teachers to do more? The best guitar teachers want their students to start off unplugged. Drum teachers start off their students with a simple drum pad. . . . Forcing technology into poor lessons won't make them sound any better, it will just allow their impact to be heard farther into the future. Rich Haglund. The 1908 ISTE NETS, or, how chalkboards revolutionized teaching. Rich discovers the 1908 version of the National Educational Technology Standards for Teachers (NETS-T). Ryan Bretag (@ryanbretag). Walk in the Shoes of Your Students. Ryan says: I issue this challenge to school leaders: walk in the shoes of your students for a day. Seriously. Open your calendar now and secure a day during the year where your administrative team can experience first-hand what it is like to be a learner in the school community and what teaching and learning really looks like from the eyes of your students: classroom experience, halls, lockers, homework, extracurricular, polices, teaching, learning, engagement, school goals, school vision, etc. I so love this idea and know that it's done in some places. I'd add that the experience should go from door-to-door, to include the 'powering down' and 'powering back up again' that many students do before and after school. Sean Nash (@nashworld). Principals as Teachers and Principals as Teachers Part II - Early Feedback. Sean's two-part series on principals serving as part-time teachers in online courses. Also, I wish more school districts understood Sean's statement that "As a district we can sit the bench and ultimately swallow the future options that arise from the state level or worse . . . or we can get really smart and make our own breaks on the local level." Steve Moore (@stevejmoore). What Are You Building? Essentially, every piece of great technology is about relationships between people and ideas. . . . I urge you . . . to start a conversation about what you're learning and with whom you're connected to. Only from that seeking out of new knowledge - through whatever barrier reducing "technology" is available to you - will there be true benefit. Jacob takes exception to Edline's claims that it 'provides the world's leading technology solutions that help schools improve student performance by harnessing the power of parental involvement, supporting teachers, and engaging the learning community,' noting that it's actually 0 for 4 in its claims. An excellent reminder that we should examine vendors' claims critically and be clear about what 'effective technology use' really means.